This is the second of two interview columns focusing on the upcoming short films Waterbird and Catkins. In the following column, producer Ksenia Harwood discusses some of the logistical challenges that Waterbird and Catkins faced in pre-production, and the role of the producer in student filmmaking more generally. In the first column, which can be accessed here, the films’ director Alexander Darby explains some of the creative decisions behind the two films, including the films’ nature themes, absorbance of folklore and approach to sound design. What is your role as a student film producer, and how does it differ from a studio producer’s role? As a student producer, my role is generally less clear-cut than that of a professional studio producer. The main similarity is that it is also my responsibility to write the budget, find the financing for a film project and make sure that the production stays within budget, which is much like what a studio producer would do. However, the rest of my tasks are variable and can be a lot more hands-on: I am essentially there to co-ordinate and supervise all the logistical aspects of the shoot, and troubleshoot any problems that arise during pre-production and on set. I am also always there for the director to have some second opinion on the creative side of things. This means I am involved in sourcing props, doing the marketing, sorting out equipment rentals, helping with casting and putting together the crew: whatever aspect of the film you think of, really, the director and I are keeping an eye on it. As student shorts have much smaller crews than professional films but are also of a much more manageable scale to oversee, this is both possible and necessary. How did you get involved in student filmmaking? Did you begin as a producer or try out different roles first? I got involved in student filmmaking through being active in student theatre, where I started out as a producer from the very first term in Oxford, after producing a short play for a theatre competition between first-year students. As the film scene in Oxford has only blossomed in the past few years, there is a lot of overlap between people who make plays and people who make films. Moreover, each play usually makes a film trailer for promotional purposes. Producing one of those is essentially like producing a very small-scale short film, and it teaches you the basics of short film production. Last summer I was approached by someone who was looking to make a short, and I decided to produce it, having gathered all of the previous experience from putting on plays and making trailers. That was my first foray into student film proper! As far as I know, most producers of film in Oxford start out similarly. How do you find the crews for student-made short films? Is it possible for somebody with absolutely no film experience to contribute to the shoot? As mentioned above, there is a lot of overlap between the drama and film worlds in Oxford, and they are both relatively very small. So, often, you just know of or hear good things about people who have previously worked on projects. It is then a case of approaching the person to tell them more about your project and ask them to be on board. Otherwise, there are also mailing lists for both the drama and film societies that you can advertise on whenever you are looking for people to help out. As for people with no film experience: it is possible to contribute, of course. Everyone has to start out without it! Usually those people would work as runners – helping out with bits and bobs on set – or as assistants to the director and producer. For these jobs enthusiasm is key, and you learn quickly, so previous experience doesn’t really matter. Waterbird and Catkins will be shot consecutively over the space of four days, meaning that many costs (e.g. for insurance and renting equipment) are minimised. Does shooting the two films back-to-back cause any challenges to arise, and how do you plan to combat them? The main idea behind shooting the two films back-to-back actually was that it would make life a lot easier! We will be using the same crew and equipment, and things like shooting permits and location scouting were carried out simultaneously, so it really feels like we are making one short with two different parts. The main challenge, to my mind, will be keeping track of all the actors who are coming and going, but I feel like that is a small difficulty to trade for an otherwise very streamlined shooting process! The emphasis upon nature within the films meant that finding the right settings was highly important. Were you and Alex involved in scouting for the locations of the films, or was this done by others? The scouting was mostly done by Alex and Nick Lory, our director of photography. They spent a week in early March going out to explore around Oxfordshire nearly every day, taking pictures of all the different possible locations. Luckily, the area has such glorious countryside that it was more a case of choosing between lots of fantastic alternatives for each scene than struggling to find a place! I was, unfortunately, in Paris on my year abroad at that point and so couldn’t join them in person. However, we would Skype after each scout and discuss their findings before making a final choice. Alex and Nick are very much masterminding the way the film will look together, and so it was only natural that they would be the ones ultimately selecting the locations. My job was mostly to make sure that it is also feasible to shoot in the places they liked. Are the same locations used in both films, or was such overlap avoided? 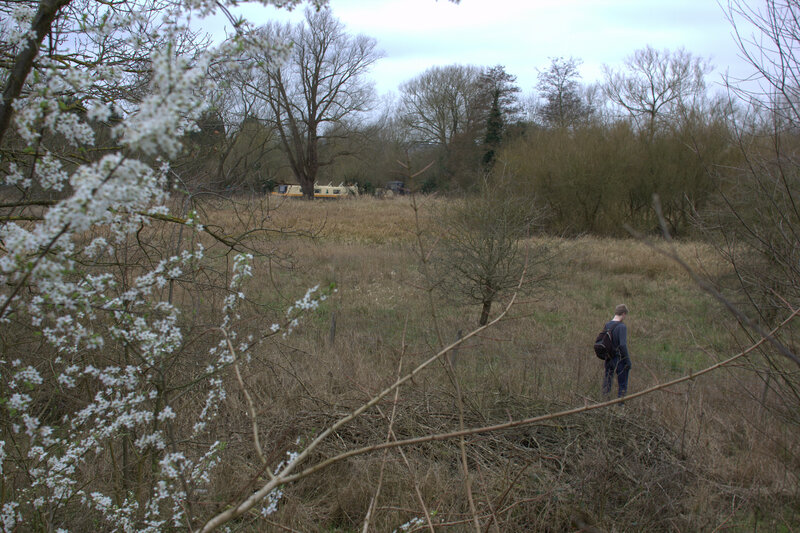 The two films are actually quite different in terms of feel and content: one involves an interview by a river, and the other sees Mark, the main character, wandering dreamily through a copse, so there is no overlap between locations. This makes for quite an intense shooting period, as we will be moving around all the time! You are planning to submit Waterbird and Catkins to a number of film festivals. Why did you choose these festivals in particular? We have selected the festivals whose selections we love and would therefore be honoured to be a part of. We have, however, also tried to stay realistic and apply to festivals that encourage non-professional submissions, or ones that are meant specifically for student shorts, such as Watersprite in Cambridge and the London Lift-Off. Could you talk us through the process of submitting to film festivals? Is it something that anybody could do, or do you need an affiliation to an institution or arts funding body? Anyone can submit a film to a film festival. All it takes is to research the festivals you feel your film fits the criteria for, and either submit online (there are a few platforms that are widely used and that let you do this, such as Withoutabox), or send through a DVD with the film. The main barrier is the cost: most festivals charge a submissions fee of up to £50, and printing plus posting DVDs is also expensive if done dozens of times. If you have the funds to cover this though, submissions are open to literally everyone! This the great thing about festivals in my view: it keeps them capable of surprising people, like Peter Strickland did, for example, with his film Katalin Varga, which he shot in Romania and funded with an inheritance he received. The film came out of nowhere to great success – I find such stories really inspiring. Waterbird and Catkins have quite a modest budget; do the financial limitations of student filmmaking ever seem artistically constraining? Of course the financial limitations are artistically constraining in a sense: you can’t do crazy stunts, build sets and hire out lavish costumes, which limits the pool of possibilities for plots and settings quite a lot. In a way, however, I feel like it trains you to be creative with what you have, which then makes you think outside the box if you ever end up working on a proper production. It also forces you to hone your skills and use them to their fullest extent – with minimal special effects, you can’t use such things to distract attention from bad camerawork, acting or directing, and it is easy to see when the production has been sloppy. This, I believe, is important for amateur filmmakers, as it means that the financial constraints force you to become better at what you do. How can student filmmakers find funding in Oxford? At the moment it is a really hard job: you have to rely on grants. We turned to college JCRs, drama societies, arts funding bodies like the King’s Hall Trust for the Arts and, notably, have been generously supported by the Vice-Chancellor. In future, however, there are plans for the Oxford Broadcasting Association to function as a film funding body, sponsoring films and making money back from screening them in Oxford. Alex and I will be working on making it happen next year as co-presidents of the OBA – we hope that it works out! For more information about Waterbird and Catkins, please visit their Facebook or Tumblr pages.